Valentine’s Day is just around the corner and it’s not just all about adults. In fact, while the holiday for romance is usually about dinners out and extravagant gifts, once you have children that changes a bit. Your meaning of Valentine’s day becomes more centralized around family than anything else. This year learn how to make Valentines Day Special for Kids with some fun and simple ideas and a little creativity. Decorating your home for Valentine’s Day is a nice way to make the day of love special for your kids. Things like pink, red and white streamers, balloons and ribbons can make your home feel incredibly festive in no time. Don’t want to buy decorations to use? Try making a DIY heart curtain for your doorways. There are several different Valentine’s Day crafts for kids to choose from out there. You can try to make a Valentine’s Day owl craft, DIY Thumbprint Butterflies or even just some simple Valentine’s hearts. Participating in Valentine’s Day crafts with your kids is a fun way to really connect and spend time together. 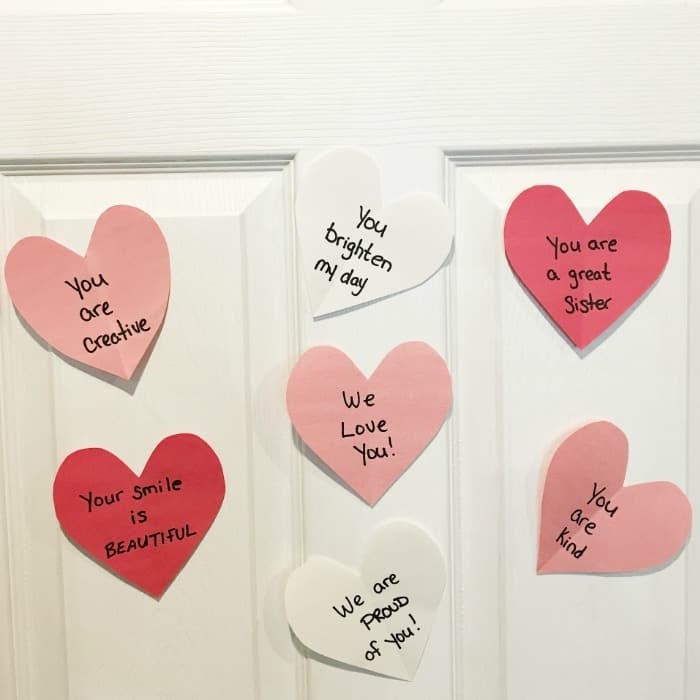 Every day from February 1 to February 14, write things you love about your child on a construction paper heart and tape them to their bedroom door. They will love reading your thoughts of love day after day and look forward to seeing them every morning! Whether they will be home on Valentine’s Day or off at school for the day, make your children some healthy Valentine’s snacks. Fudge stuffed strawberries are a delicious idea for your little ones to enjoy at home or at school. If you are looking for something perfect to send for a Valentine’s class party, try making some two ingredient Valentine bites. Spend some time in the kitchen with your little baking up some delicious Valentine’s treats together. Spending time cooking or baking together not only boasts several benefits for your kids and your relationship with them, but it is also an enjoyable way to spend time together. After all, you get to taste test your creations when they are finished. If you still want to enjoy a Valentine’s Day meal alone with your significant other, serve your kids up a special dinner just for them. Have them get dressed in their fanciest clothing while you cook up their favorite dishes. Seat them and offer them sparkling water in plastic champagne glasses. Serve them as though they were in a fancy restaurant. Bonus points if your beautiful table is decorated to be fancy, and you create your own menu for them to “choose” from. Don’t forget the fancy music. There are several ways to make Valentine’s day special for kids this year. Just get creative and have some fun with it. 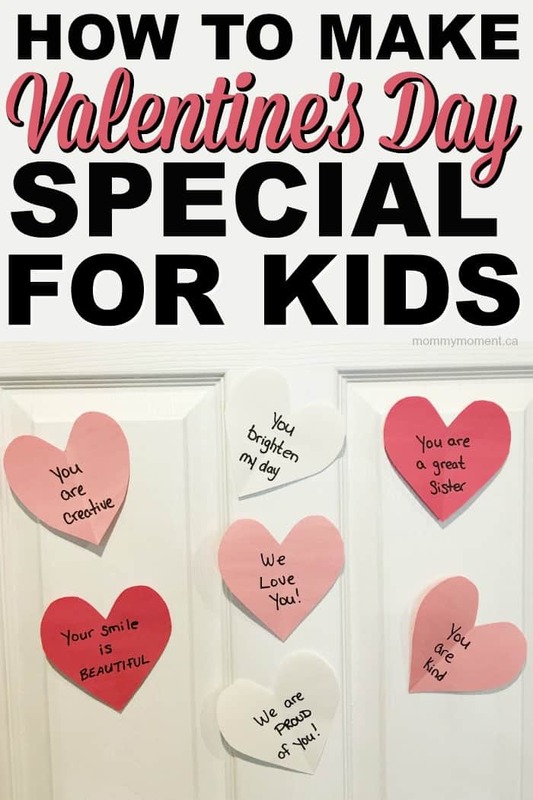 How do you make Valentines Day special for your kids? We’ve always made ours! Paper hearts. Lot’s of fun! Our family always tries homemade. I don’t think my kids have picked out their cards yet. Usually my daughter like to get Monster High. We are doing Lego cards with suckers attached. One will be frozen,and my Son hasn’t decided yet. My grandson likes to make his own cards. I have no idea what they are handing out this year, depends on what Walmart has when I go to buy them 🙂 They do want to hand out mini cupcakes to their class mates though so we’ll definitely be doing that! WE don’t have kids but I like to make my hubby a card! My little one isn’t school aged just yet but we do hand make homemade ones for all the family. I always made some with my oldest and got him his favorite character ones for his close friends. We have Ariel cards to hand out this year! We have always made our own valentine cards with whatever cool craft stuff we can get our hands on…. Glitter, lace, card stock, sequins. Lots of creativity and fun! My grandchildren have Frozen and Transformers to hand out.